Triple Canopy and Artists Space are pleased to present a screening of Tan Lin’s PowerPoint videos Bibliographic Sound Track and The Ph.D Sounds, with the former accompanied by a live perfume sound track, the latter by a DJ set by Mösco. 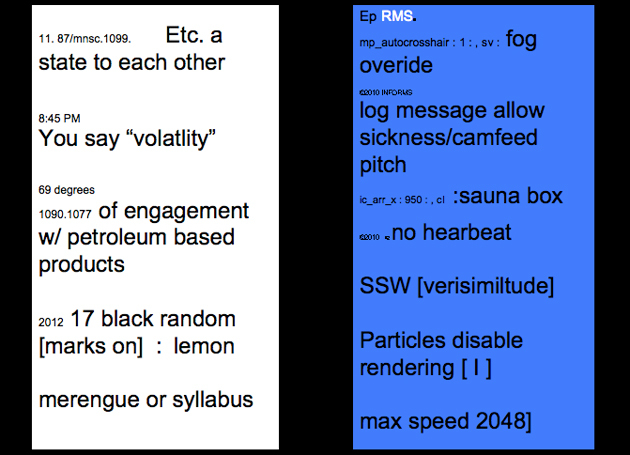 The videos explore communications platforms such as Twitter, SMS, status updates, IM chats, programming languages, video-game walk-throughs, the couplet, and the PowerPoint slide as they affect reading and genre, projected in an environment that has absorbed everything next to it in the room—from bibliographies to the smell of wet sphagnum peat moss, the perfume Wet Pavement London, Glade air freshener, and the music of New Order and Lucky Dragons. The screening will be followed by a discussion between Lin, Triple Canopy contributing editor Dan Visel, and Artists Space curator Richard Birkett.